NEW Positions Building Power with a Progressive Union: SEIU Healthcare 1199NW! SEIU 1199NW is Washington's largest healthcare union, an independent democratic organization which advocates for strong jobs, access to healthcare for all and strong patient and client care and services in Washington’s hospitals, clinics and mental health facilities. There are NEW positions available with both existing and newly organized healthcare workers throughout Puget Sound and Central Washington. Join a team that is doing bold worksite based organizing and bargaining for greater voice for working people and a more just society. 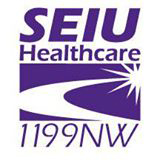 SEIU Healthcare 1199NW is an organization that values development, engagement and growth for staff and members. Internal Healthcare Organizers: Work with existing union members to develop new leaders and activists within union chapters to bargain and enforce strong contracts, take on and win workplace improvements and activate union members in building a union voice in their worksite and their larger community. Your job would focus on identifying and activating leaders, utilizing strong active listening skills to determine workplace concerns and work collaboratively with co-workers and union leaders to develop and implement solutions and actions that affect change. External Healthcare Organizers: Work with non-union healthcare workers to successfully form their union. Engage worksite leaders and member organizers around a vision of union difference and leadership that WIN union elections and first contracts. Your job would focus on identifying and activating leaders, utilizing strong active listening skills to determine workplace concerns and articulate a plan to win resulting in the successful GOTV of worker votes in union elections or card check campaigns. SEIU Healthcare 1199NW union members are healthcare workers: from nurses who provide life-saving direct patient care to critical support staff that ensure patients are in clean rooms with good meals. Healthcare workers are compassionate, caring people who are fun and rewarding to engage and work with. Through workplace organizing and advocacy union members build respect and equity for the important, and sometimes hidden or undervalued, work done by a majority female workforce in our States’ hospitals, clinics and mental health facilities. SEIU Healthcare 1199NW uses a leadership model that develops the voice and skills of our diverse membership. SEIU Healthcare members have consistently supported and led in our larger communities social justice initiatives including; racial justice, immigration reform and affordable health care for all. Women & candidates of color are encouraged to apply. Labor or community organizing experience preferred but not required, all positions at 1199NW offer orientation, training and development. Competitive salary and highly generous benefit package available commiserate experience.